For Shine A Light at the Portland Art Museum. 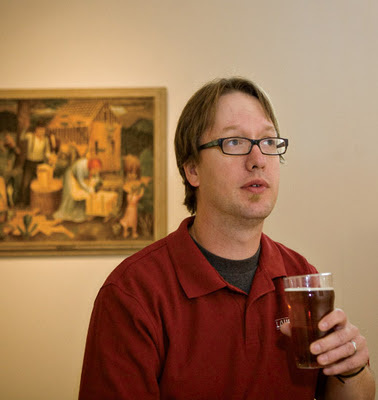 Each year I work with three local breweries, I give them a tour of the Portland Art Museum, they choose an artwork and after researching that piece, they create a new beer inspired by it. The three beers are available for free sampling only on the night of the event. Occasionally the beer will also be served at local pubs in town. In 2009 I worked with Lompoc, Laurelwood, and Lucky Lab Breweries of Portland and in 2010 I worked with Coalition, Hopworks, and Rock Bottom. Click here for an editorial. Click here to read a review of the event. Click here for an interview with Brewpublic.